Update, Jan 2017: This feature is replaced by Order Discussions. "As a manager, sometimes I get order requests that are missing details, so I can’t place an actual order..."
Sound familiar? We've been hearing this type of comment from a lot of lab managers. Lab members often don’t know all of the details of the compound they are searching for, or maybe they just forget to specify them. The end result is the same: lab managers don’t have all the information they need in order to get the work done. We listened to your comments and have come up with a solution! 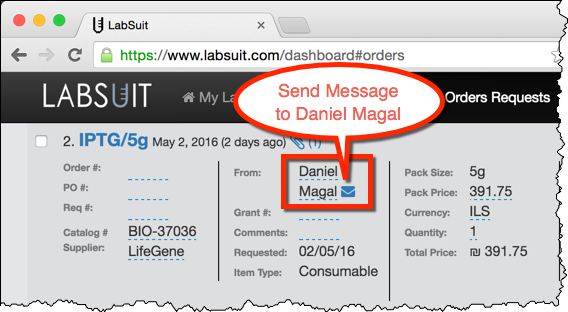 We have introduced a new option, which allows lab managers to send clarification request messages to other lab members without leaving the context of orders management. After the order request is submitted, the new option makes the communication process much easier, and allows managers to get in touch with their lab members without leaving the LabSuit screen. Once the message is sent, it will instantly land in the lab member's email inbox. The message will include a direct link to the LabSuit order request, allowing him or her to update the order. New at LabSuit! Budget Consumption Reports!